Second-grader Brayan Hernandez-Martinez wraps up the Aztec ball carrier as Ethan Aggeler and Rylan Ernst converge to help on the tackle on Saturday. The Demons won 13-6. The Durango Demons fifth-grade Young America Football League team moved to 5-0 on the season with another lopsided victory, this time taking care of Montazuma-Cortez 37-19 last weekend. Wide receiver Noah Miles was on the receiving end of two touchdown tosses from quarterback Linkin Griego. Miles finished the day with four catches for 72 yards. Griego had five total TDs against one interception in the win. The Demons’ defense was just as good as the offense and gave up two of the TDs late in the fourth quarter when the game was already decided. Conor Jones recovered a fumble and Cole Pontine had an interception. The Demons will play Aztec on Saturday at Escalante Middle School. Cold and wet weather couldn’t stop the Demons’ second-grade team from picking up a 13-6 win last weekend in Aztec. Center Jerren Miller-King handled himself well in the sloppy field conditions and helped lead the way for Jerad Lopez and the offense to find the end zone for a touchdown on the Demons’ first drive of the game. Rylan Ernst was on the receiving end of one TD. Darion Allen led the defense, which also got key plays from Isaiah McCrady, Keelyn Reynolds and Javier Soto. The Demons will be back in action on Saturday, hosting Bloomfield at Miller Middle School. Durango’s fourth-grade team crushed Montezuma-Cortez 40-0, with dominant performances on both sides of the ball. Brady Hoerl returned an interception 59 yards for a touchdown, and Tatum Rose and Lyle Huff broke big plays on offense. Rose led the Demons with 106 total yards and two touchdowns, while Huff broke touchdown runs for 59 and 35 yards. Cooper Mitchell also recorded an interception to go with his five tackles on defense. Durango will play Bayfield on Saturday in Bayfield. 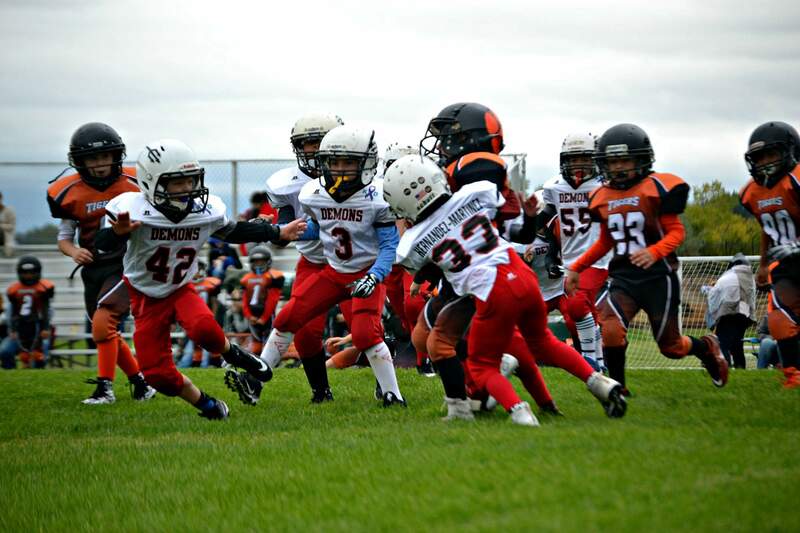 The third-grade Demons were overpowered by a bigger Bloomfield Bobcats team and lost 25-12 last weekend. Bloomfield scored on its first three possessions, but in the second half, the Demons defense forced four turnovers. Tyler Hoerl came away with an interception, Keenan Aragon recovered two fumbles and Grady Feeney also had a fumble recovery. The offense fed off the defensive performance, with Feeney finding Blaze Aguilar for a 35-yard touchdown. Feeney also broke a 40-yard run for a TD. The Demons will face the Farmington Saints on Saturday at Miller Middle School. Turnovers doomed the Demons’ sixth-grade team to a 42-14 loss to Montezuma-Cortez last weekend. Durango had the lead midway through the third quarter thanks to a kick return for a touchdown from Jaxon Fancher and a TD pass from Tyler Harms to Jacob Roberts. But multiple turnovers late in the game that Cortez turned into touchdowns killed any momentum the Demons had. Ian Szura led the defense with 16 tackles. The sixth-graders will play Aztec on Saturday at Escalante Middle School.